The very first piece of art I collected, at the age of 18 and paid for with tax returns, was a series of Koshare clowns eating cotton candy and watermelon. 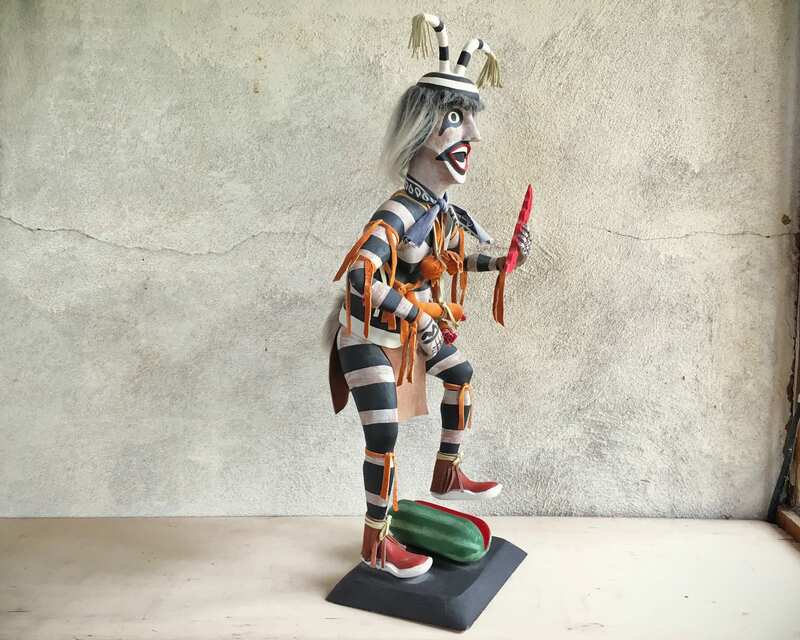 So when I saw this amazing and large carved wood, hand painted Koshare clown, slice in hand and rest of the watermelon at this feet, with amazing detail and so well done--I just had to have him! 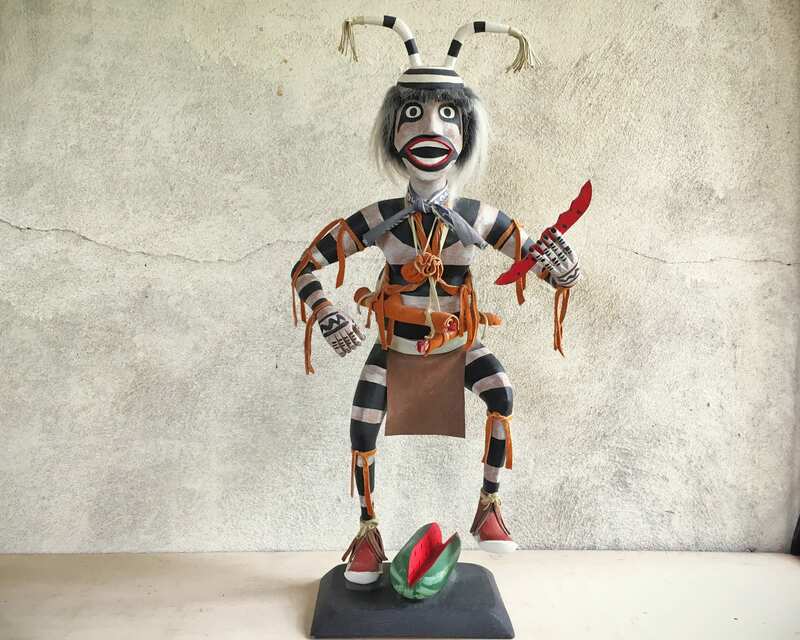 I have always loved the Koshare clown, whose role is of jester or trickster in the Kachina tradition. This piece is so well done, signed by Harris Johnson, who then writes his name as it would be pronounced and/or written in Native tongue. 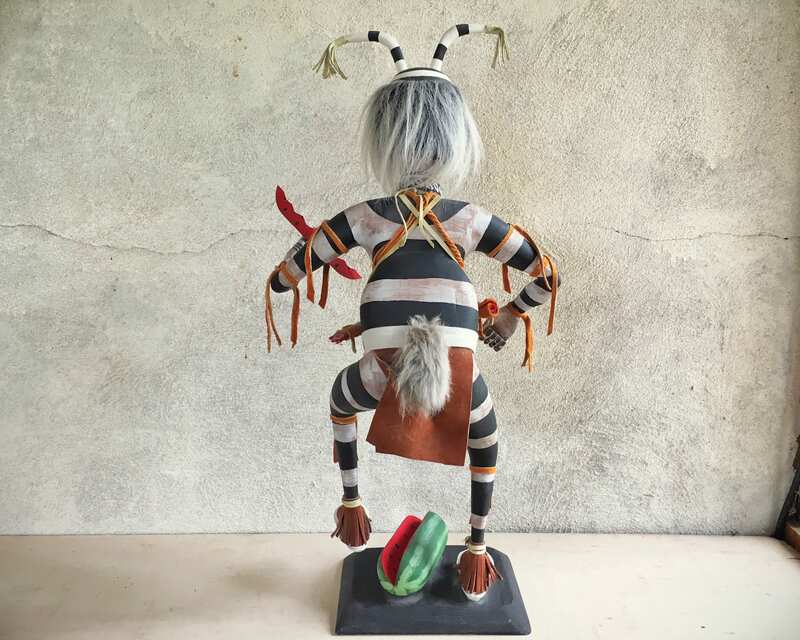 From an interview with Pueblo potter Roxanne Swentzell, one of the most renowned Koshare makers today, "The koshares, the Pueblo clowns, serve to balance things in the pueblo. They relay messages to the community that other people cannot say, but the koshare can, better than anyone. The clowns reflect something people need to see about themselves. Like when someone is greedy: instead of shouting, the clown will sit in front of his house, and act like a greedy individual, collecting rocks — and will transmit his message to that person by doing so." 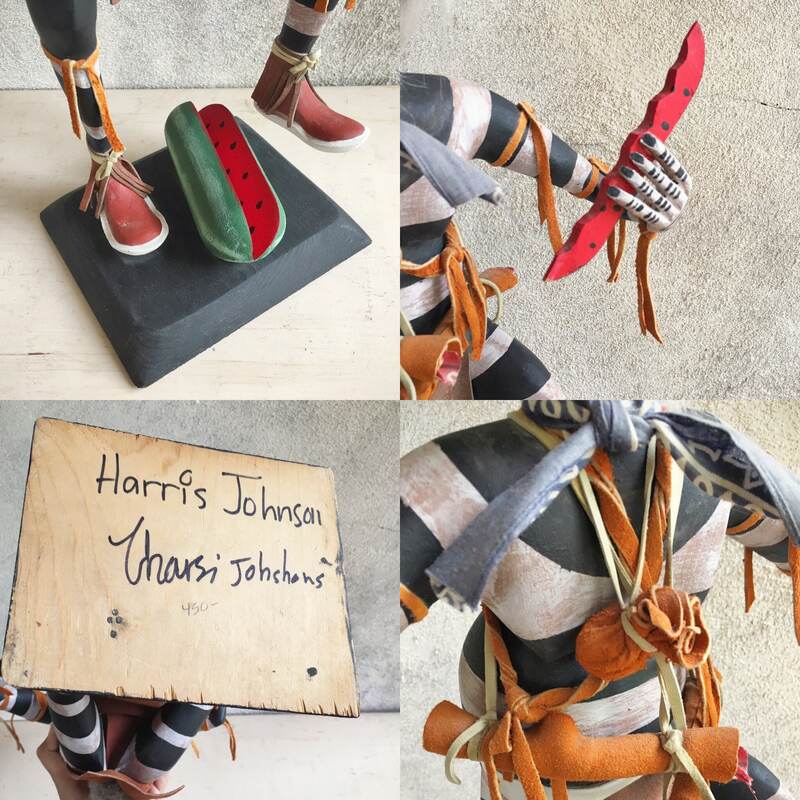 We have learned that Harris Johnson was represented by Ortega's Tradiing Post in Gallup in the 1980s and 90s, and is a listed artist. The original price is written in pencil: $450. Today most koshares of this size are quite collectible and can sell in the thousands for certain artists. This piece measures 21-1/4" tall by 11-1/2" wide at the widest point, and the base is 7" by 6". This piece was displayed in a home, and the only condition issue was the accumulation of dust, which I've since cleaned. 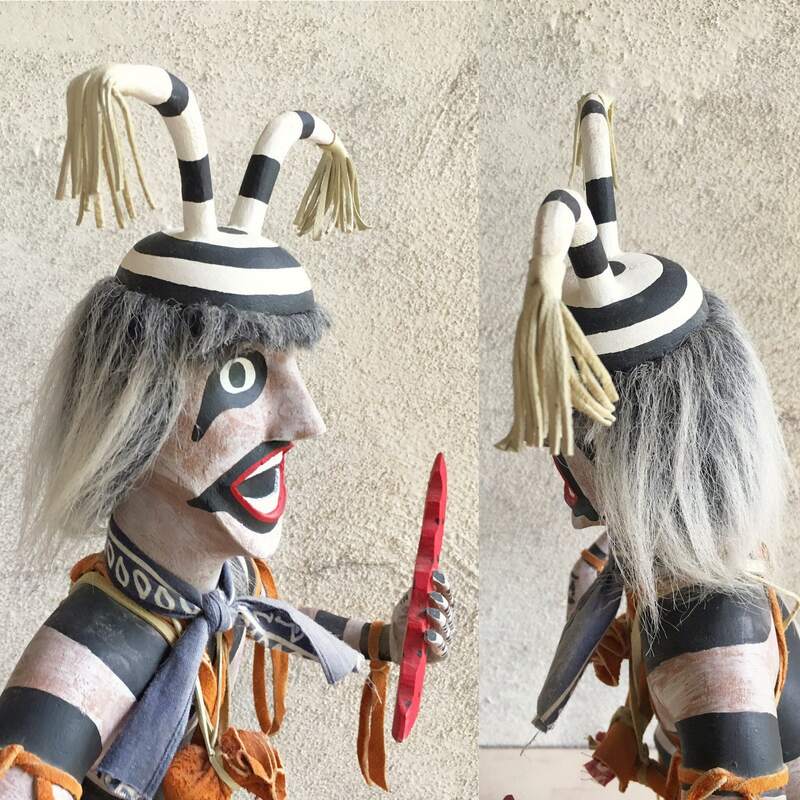 The clown's "hair" is still in great shape, the cloth bandana, leather ties and clothing, the fur tail. There may have been something in its right hand, but even if something was there, it doesn't look as if anything is missing. Very good vintage condition. Truth, beauty, humor. Three of the best virtues in life.